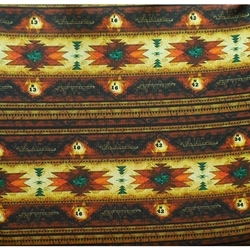 A tribute to Native American southwest tribal design is shown on this cushion. This pattern shows us a southwest Native American tribal pattern that has vibrant rustic coloration and a Bingo ball stealthily placed amongst the pattern. This double seat cushion has a seat flap on the back. The foam inserts in this double cushion are roughly three inches thick. There is a handle on both ends of the cushion for ease of carrying. Each cushion measures 13x13.5x3". Two of these are fashioned together by 2.5" of patterned fabric. This cushion is black.